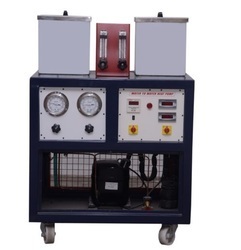 Leading Manufacturer of refrigeration test rig, air conditioning test rig, ice plant rainer, electrolux refrigerator test rig, water to water heat pump and cascade refrigeration systems from Ambala. Condenser Cooling fan Compatible capacity with permanent lubricated motor. Evaporator Made of Stainless Steel, Insulated with ceramic wool/P.U.F. Expansion Device Capillary Tube, Compatible Capacity. Pressure Gauges 2 Nos. Safety Control: overload and over current protectors for compressor and Time delay circuit. The set up demonstrates the students about the basic principal of a refrigeration cycle. 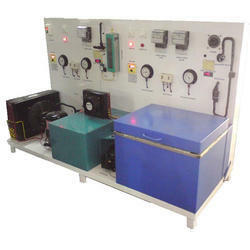 The Refrigeration Test Rig is designed for the study of thermodynamics of vapour Compression refrigeration cycle by way of demonstration and experimentation. It has a facility to measure various parameters for experimentation. Safety Control Over load and over current protection for Compressor with Time delay circuit. Compressor Hermitically Sealed Compressor. Capacity 1 Ton, Kirlosker make. Evaporator Compatible to 1 Ton, made of copper tube and aluminium fins fitted with compatible capacity fan. 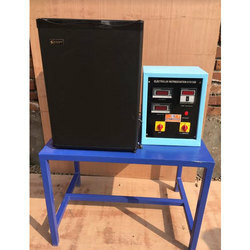 Electric Supply Single Phase, 220 V AC, 50 Hz., 10 Amp. Temperature Measurement Digital Temperature Indicator with multi-channel switch. 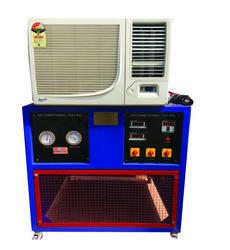 We are offering a wide range of Air conditioning test rig at the most affordable market price. These trainers are manufactured under the supervision of expert professionals using the latest technology and quality tested raw materials. Appreciated for their hassle-free installation, sturdy construction, corrosion resistance and longer functional life, offered trainers are widely demanded by the clients. The Air Conditioning Test Rig unit is required to conduct experiments and demonstrate the process of cooling of atmospheric air. The self-contained unit will be fitted with all instruments facilities so that temperature, pressure etc. may be measured at different points in the air conditioning system. To Study the Vapour Compression Air Conditioning Cycle. Accessories like Hand shut off valves, Filter drier and Thermostat, Pressure gauges will be provided. Compressor Hermitically sealed compressor, Kirloskar make. Tank The inner tank shall be fabricated out of Stainless Steel. Evaporator Made of Stainless Steel, Insulated with ceramic wool/puf. Expansion Device Capillary Tube Compatible capacity. Safety Control Overload and over current protectors for compressor and Time delay circuit. The unit enables the students to study the Basic Principals of ice plant cycle within a short period. 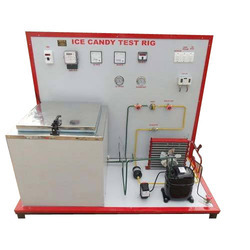 The Ice Plant Test Rig is designed for the study of thermodynamics of vapour Compression refrigeration cycle by way of demonstration and experimentation. It has a facility to measure various parameters for experimentation. Ice cans are kept in liquid tank, which is cooled by the refrigerant evaporator. 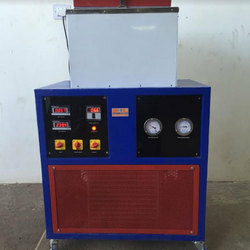 As conventional ice plants take 12-24 hours to complete the cycle, this ice plant is specially designed to demonstrate process of ice formation to be complete within period of 4 hours and hence it is most suitable for laboratory use. To Study the Working of Ice Plant. To Study the Refrigerator Circuit. Safety Control: Overload and over current protectors for compressor and Time delay circuit. Sealed Circuit The System has no moving parts at all, which makes it Silent and very durable. Electric Supply Single Phase, 220 V AC, 50 Hz, 5-15 Amp. The set up demonstrates the students about the basic principle of a vapor absorption refrigeration cycle. The test rig is designed for the study of the thermodynamics of vapor absorption refrigeration cycle by measuring the temperature at a different position. To Calculate Co-efficient of performance. Temperature Measurement: Digital Temperature Indicator with multi-channel switch. We are offering a wide range of Cascade Refrigeration Systems to our clients. Looking for “REGENERATION & AIR CONDITIONING LAB EQUIPMENT”?